The Venezuelan Air Force, officially the Venezuelan National Bolivarian Military Aviation (Spanish: Aviación Militar Nacional Bolivariana de Venezuela) is a professional armed body designed to defend Venezuela's sovereignty and airspace. It is a service component of the National Armed Forces of the Bolivarian Republic of Venezuela. The organization is also known as the Bolivarian National Air Force of Venezuela. Its current official name has been in use since the end of 2008. It was previously called the Venezuelan Air Force (FAV; Spanish: Fuerza Aérea Venezolana). Most of the airbases in Venezuela were built in the 1960s as part of a massive expansion program. The main fighter types in those years were Venom, Vampire, and F-86. Bomber squadrons typically operated B-25 Mitchell aircraft. The 1970s and 1980s saw a considerable increase in capacity, mainly because the rising oil prices enabled the FAV to re-equip most of its units. The mixture of various aircraft types was maintained, and the Mirage IIIE and Mirage 5, VF-5A and D, T-2D, OV-10A and E, and T-27 were introduced. Venezuela was one of the first export customers for the F-16, which arrived in 1983 to equip the newly formed Grupo Aéreo de Caza 16 at El Libertador Airbase. In the 1992 Venezuelan coup d'état attempts, elements of the Venezuelan Air Force were key participants in the rebellion. FAV units at El Libertador Air Base under the command of Brigadier General Visconti seized control of the airbase and then launched an attack on the capital. OV-10s, T-27s, and Mirage III fighters under Visconti's command bombarded targets in the capital and loyalist air bases, destroying five CF-5 fighters on the ground. Two loyalist pilots escaped with F-16 fighters and shot down two OV-10s and a Tucano, claiming air superiority for the government. Two more rebel OV-10s were lost to ground fire. As the tables turned on the coup attempt, General Visconti and his allies fled in two C-130s, two Mirages, an OV-10, and several SA 330 helicopters. The AMV purchased 35 Sukhoi Su-30 planes from Russia in July 2006, as a result of the United States embargo on spare parts for their F-16 force. 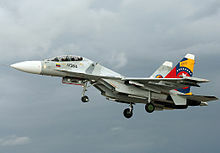 In 2008, Venezuela was reported for a potential acquisition of a number of Su-35 fighter aircraft and a second batch of aircraft 12-24 Sukhoi Su-30 from Russia. It did not proceed further. ^ "Sukhoi Su-30 story in colours. Sukhoi Su-30 fighter worldwide camouflage and painting schemes". Mars.slipsk.pl. Archived from the original on 30 October 2014. Retrieved 30 October 2014. ^ "F-16s for Venezuela". F-16.net. Archived from the original on 30 August 2014. Retrieved 30 October 2014. ^ "Venezuelan F-16s". Airtoaircombat.com. Archived from the original on 8 May 2004. Retrieved 30 October 2014. ^ Cooper, Tom. "Venezuelan Coup Attempt, 1992". ACIG.org. Archived from the original on 29 October 2013. Retrieved 22 January 2013. ^ "Venezuela Buying Su-30s, Helicopters, etc. From Russia". defenseindustrydaily.com. Archived from the original on 16 June 2017. Retrieved 25 May 2017. ^ "Venezuela buys Russian aircraft, tanks to boost power". UPI. Archived from the original on 30 October 2014. Retrieved 30 October 2014. ^ "Pese a la crisis económica, Venezuela compra doce cazas rusos". Clarín. 29 October 2015. Archived from the original on 2 November 2015. Retrieved 2 November 2015. ^ a b c d e f g h i j k l m n o p q r s t u v "World Air Forces 2017". Flightglobal Insight. 2017. Retrieved 4 April 2017. ^ "La Fuerza Aérea Venezolana exhibe sus vehículos aéreos no tripulados ANT-1X". Infodefensa.com. 25 November 2011. Retrieved 30 October 2014. Wikimedia Commons has media related to Air force of Venezuela.